My body has not seen a beach for almost two years, but in a month, I’m headed to Antigua. Time for a much-needed detox. I eat well and exercise, but I also firmly believe in the 80:20 rule, which means 20 percent of the time you will find me knocking back wine or mainlining sweets. I don’t believe in crash-dieting for any bikini, but I’m open to improving my diet habits ahead of the trip. Enter Elle Macpherson, founder of the alkalizing supplement brand, WelleCo. Macpherson and Dr. Simone Laubscher, PhD, have created a four-week week body reboot plan that promises to get you bikini-ready without relying on any unhealthy tactics. And I’m putting it to the test. Keep scrolling to see how I got on over the four weeks. According to Dr. Laubscher, many health problems stem from a body that is acidic, which is why at the heart of WelleCo is the ethos that a more alkaline pH equals a healthier body. 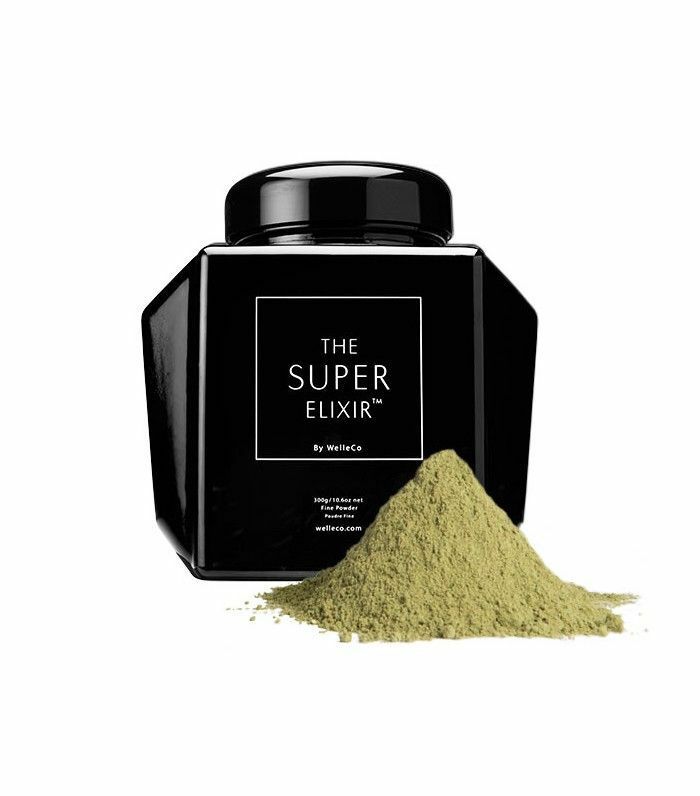 The WelleCo supplements—The Super Elixir (£96) and Nourishing Protein (£48)—are key to the alkalizing reboot, but the plan also aims to instill healthy habits that are free or super affordable over the four weeks. As well as promising to get you ”looking and feeling healthy,” the plan should help you sleep better, find it easier to relax and give your skin more glow—all things that I could really do with right now. It doesn’t guarantee weight loss, but I’m hoping that I’ll notice a loosening on my waistline by the end of it. Scroll down to see the plan. • No carbs after 5 p.m.
• Take The Super Elixir alkalizing greens with 500 ml of water every day, once a day. • Drink at least two litres of filtered water every day. Before starting the challenge, I headed to my local Tesco and bought numerous two-litre bottles of Evian water. I drink a fair amount, but I never keep track, so while it’s not the most cost-effective way of getting in my eight glasses per day, at least I would know how much I had downed. No carbs after 5 p.m. was easy at the beginning of the week. I clarified that fresh fruit and veg were allowed in the evenings, just the refined and starchy carbs (otherwise known as “the tasty ones”—pasta, bread and potatoes) were off the menu. The trouble was that not eating them after 5 p.m. was easy because I was green-lighting them the rest of the day. Thing is, I normally wouldn’t eat pasta or bread as standard, but I was having them for breakfast and lunch most days. I ate more bread last week than I ever usually would. On two evenings (Wednesday and Friday), I also had wine, which is a carb, and if I’m being honest I shared a mac and cheese with a friend on Friday night (the wine made me!). 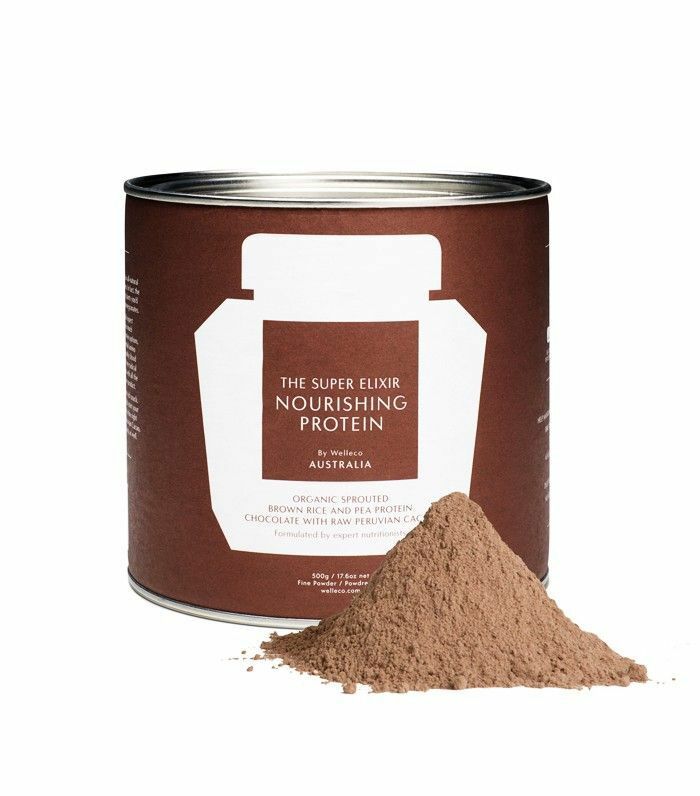 • Replace one meal a day (your choice which one) with The Super Elixir Nourishing Protein mixed with 400 ml cold almond milk and one to two fruits to create a super-delicious smoothie. After last week and going wild with numerous loaves of bread, I realised I actually felt bulkier than before the reboot. So replacing a meal with a protein-rich smoothie was very much welcome. I found it easiest to replace my breakfast with the smoothie; there is something quite bleak about coming in from a hard day at work and sitting down to a smoothie rather than a nice chicken salad (no carbs after 5 p.m., remember). Also, the smoothie is best drunk cold, so I couldn't transport it to have for lunch. It was incredibly tasty; I blended it with frozen blueberries (which made it extra cold) and a small banana, which tasted great and was super filling. Truly. In keeping with the ethos of WelleCo, the protein powder is plant-based, which is alkalising (whereas whey protein can be acid forming). Upping your protein intake is key to any diet since it helps you to feel fuller for longer. You see, eating protein helps release various 'satiety hormones' such as Peptide YY and reduce the 'hunger hormone' ghrelin. Also, the fibre from the fruits takes longer to digest, meaning you won't get hungry as quickly. I definitely found that the shake kept me going until lunchtime without feeling the need to snack. I also found that some days I would just bung the protein powder and The Super Elixir into the blender, which meant I only needed to worry about drinking my two litres of water each day. What's interesting is that I have definitely been snacking less; hunger can often be confused for thirst and by increasing the water I'm drinking I have been less likely to give into my cravings for a bag of Malteasers. I'm actually looking forward to week three. Cheated: Twice (I went for an Indian meal on Sunday night and very much enjoyed my post-5 p.m. coconut rice and naan bread). The other time I didn't want a shake and had a salad for dinner (I know, crazy). Inches lost: One, around my waist. • Add cayenne pepper to at least one meal a day. It will boost your metabolism and create a thermogenic effect, which will help burn calories. This week felt easier in that there was only one new thing to remember to do. On busy days I'll sometimes get to 11 p.m. and think Damn, I haven't had The Super Elixir, or I might not be able to fit in a smoothie if I'm on the go all day. Adding cayenne pepper to meals was super easy. We batch cook chicken and vegetables on a Sunday for our lunches, so I added some to that, then sprinkled extra onto each portion for good measure before serving. It is hot, mind. I have grown to like spicy foods, but one meal was so hot it took me a good 30-minutes to recover, so be warned. I felt leaner this week (which is extra surprising since it was my time of the month). The first couple of weeks on the plan, I felt a bit more bloated than I usually would; I'm not sure whether that was down to all the extra water I've been taking on, but I felt, this week, like everything was falling into place. Also, I only got one spot this month which is literally unheard of for me. Now whether it is down to the alkalizing drink or just being more mindful of what I'm eating, I'm not complaining. Next week is the final week, and by the looks of the plan, it will be the toughest yet. I have cheated a little throughout the month, but I always remember Gigi Hadid saying that you need to "eat a burger to stay sane" (for me it's chocolate). But next week chocolate (unless in The Nourishing Protein form) is off the menu. Wish me luck, and check back next week for the final update. Cheated: Twice—I went for a work meal, and I couldn’t resist the gnocchi, and it was my boyfriend’s birthday, so we went out for that. Inches lost: Half an inch, around my waist. So 1.5 inches, total. Each week builds on the one before, so check back here next Tuesday to see how I got on with the final week. • Increase your intake of green vegetables. Thanks to the weeks building on each other, by week four this lengthy list that had scared me at the outset didn't seem all that daunting thanks to all the groundwork I'd put in. I was, however, still concerned about cutting out dairy as I do love a cappuccino but a black coffee is actually just as tasty (I really do love coffee though). I managed to go the whole week without a morsel of dairy or processed carbs passing my lips, which I was quite surprised by. As for the sugar, this was trickier. Not because I was secretly snuffling at Malteasers, I actually didn't crave sweets or chocolate once during the week. But I had some wine with friends on Saturday night and of course that is, essentially, just liquid sugar. The brilliance of this plan is that it's not overly faddy; it's devised by a doctor. The biggest thing I've noticed is that it really has helped me be more mindful about my food and drink choices. I knew exactly what I was doing when I had wine with friends and again when I picked up the frozen yoghurt from the freezer and promptly put it back without eating it, reaching for an apple instead. I'm a serial snacker, anyone who knows me knows that, but I managed to get this under control without really trying. The thing is, I've been drinking way more water than I ever did before, and although I knew that thirst could be mistaken for hunger, I didn't realise that accounted for so much of my snacking. Thirst… and stress. If we can learn to be more mindful about how we're feeling, and in turn what we're eating, then I think that's half the battle. I'm not going to lie, this wasn't the hardest plan, but then I didn't stick to it 100 percent. I'd say I was with Elle around 80 percent of the time, the other 20 percent you would have found me with a glass of red wine in hand. But despite that I dropped two inches off my waist in four weeks, and I had lost six pounds when I weighed myself this morning. My stomach is noticeably flatter and my clothes are sitting better. Do I look like Elle Macpherson in a bikini? No, but I look better than I did before, and that's good enough for me. Inches lost: 0.5, so that's two inches in total. Are you tempted to try the WelleCo 4-Week Body Reboot Plan? Give it a try and let us know how you get on.